as the title says im looking for a pickled jackfish recipe, have some leftover that i want to use up before the summer fishing starts. I found on online that says its a cold recipe, no heat used, so does that mean your just using raw fish? it doesnt specify whether or not your supposed to pre cook it or not. Anyways id appreciate any of your recipes. If by "jackfish", you mean what I call "Northern Pike", let me dig a little. The one I use is indeed a cold recipe, with raw fish. I've got Canadian bacon that needs to come out of the smoker RIGHT NOW. I'll get back to you. I do indeed mean northern pike. Thats alright im at work till 5 anyways. Gosh the bacon smells good!!! Okay, I follow Pikeman's recipe for "Pickled Heart or Duck or Goose Breast (Brine). Heat brine ingredients until sugar and salt are completely dissolved. (Do not boil) Keep hot for 1/2 hour. Cube the raw pike, bones and all. Place everything in a crock or glass jar and refrigerate. Stir a couple of times. Ready to eat in about a week. Bones will dissolve. Catch northerns, fillet northerns,rinse fillets thoroughly. Cut fillets into approximately 3/4" x 3/4" chunks. Put fish chunks into a large bowl, add saltwater, cover bowl, , and soak fish for 48 hours in saltwater in refrigerator. You may need a double batch of saltwater if not enough to cover fish. After 48 hours, take fish out of refrigerator and rinse fish chunks thoroughly in a colander and also rinse your large bowl. Put rinzed and drained fish back in bowl and cover fish completely with white vinegar. Cover bowl and put back in refrigerator for 24 hours. After 24 hours, drain fish in colander. Do not rinse. 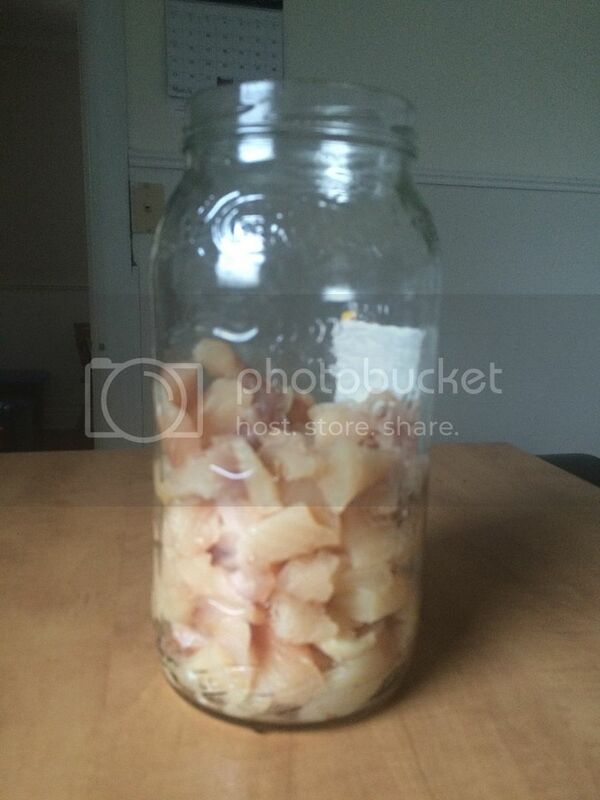 Fill jars with alternate layers of fish chunks and large chunks of onion. Pint jars work well. Fill jars with brine, cover jars, and put in refrigerator. Let fish set one week before eating. Any bones will have dissolved by this point. Brine can be made earlier the same day as it needs to be cooled before putting over fish in jars. Bring brine to a boil, cool, pour over fish in jars and refrigerate finished product. Notes: 4 to 5 medium sized northerns (3-4 lbs) will take approximately a double batch of saltwater and a triple batch of brine. I have a pickled Northern recipe somewhere. I'll see if i can find it and you can compare it to any others posted here. I've used it for salmon and it was really good. It may take a few days, first priority is to get the Easter ham in the brine so it's ready in time. Well I decided I'll try lilharvs recipe, got the fish in the first stage. Didn't think i'd get multiple recipes so now I have to catch more to try them all. I'll keep updated with pictures as I go. Alright the pike are now in the brine for a week. As I mentioned in trying out lilharvs recipe. I'm using 2, 6-8 pound pike. 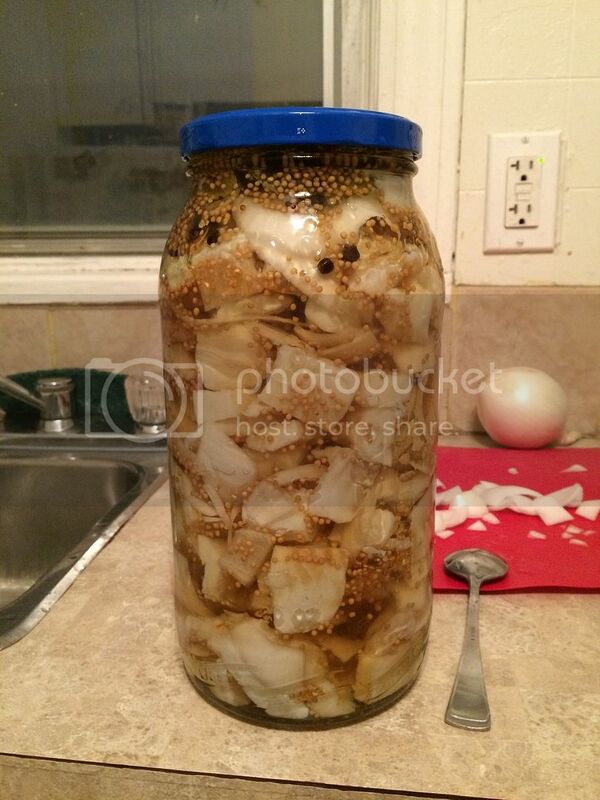 The jar looks small in the pictures but it's actually a giant 2.5 litre vlassic pickle jar. Which happened to fit everything perfectly. Will update with final taste. Come on tiffin good or bad? Thanks for posting that recipe. I've used a lot of different recipes for pickled northerns and this one is by far the best I've tried. I tweaked it just a tad by adding a little NA white wine to the brine, but it is delicious and everyone who has tried it agrees. Thanks again! Mine is almost exactly the same as lilharv posted. Procedure is the same with the only difference being the brine. The sugar/vinegar ratio is less which will most likely make the product a little less sweet. The spice additions in lilharv's brine are pretty much a pickling spice mix. The finished products are probably very similar.